The ‘O’ in Sunn O))) is silent, and so is the exalted fridgecore purveyors’ new album. News of this monumental artistic endeavor broke today on the Seattle natives’ Ello page in the form of a scrambled animated GIF image, which remained cryptic until a fan promptly unscrambled it using a World War II-era German military Enigma machine. Titled 50′ 00″, the latest studio offering from extreme music’s most polarizing duo was recorded on phonautogram in North Korea’s central library. It was produced by renowned experimental decomposer John Cage, and mixed by acclaimed washing machine technician Merzbow at an abandoned love hotel with good architectural acoustics in Saitama, Japan. According to Sunn O))) guitarist Stephen O’Malley, only 433 copies of 50′ 00″ have been printed, and they will be randomly scattered throughout the Deep Web beginning sometime in winter. Black market forces will determine the price of each copy. Containing just one track that shares the album title, 50′ 00″ clocks in at exactly 50 minutes. To combat sloppy piracy and foster respect for artistic intentions, each copy of the album was made with patented IMF technology; any playback of 50′ 00″ that exceeds or falls short of 50 minutes by a nanosecond will trigger a self-destruction sequence with a countdown timer counting down from the square root of one’s current Body Mass Index (BMI), rounded to the nearest whole number. To promote 50′ 00″, Sunn O))) will tour libraries throughout North America this Christmas season with supporting acts the American Association of Mute Ventriloquists (AAMV), Literacy for Incarcerated Teens (LIT), and Memorex. Members of the public are welcome to partake in an exclusive sneak preview of 50′ 00″ tomorrow at the “Zoroastrian Pottery” section of an undisclosed second-hand bookstore somewhere in Southern Missouri. 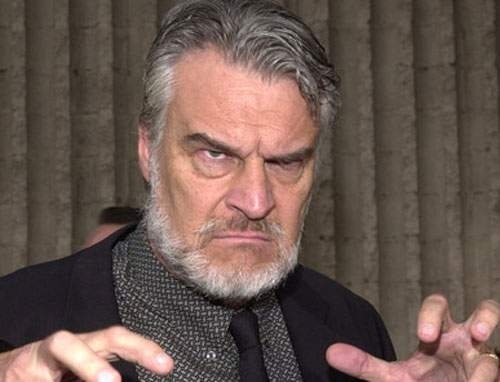 Richard Moll, the actor known to millions as the hulking but loveable 6 foot 8 bailiff on the 1980s television show Night Court, has become the new face of one of the most iconic bands in all of heavy metal. 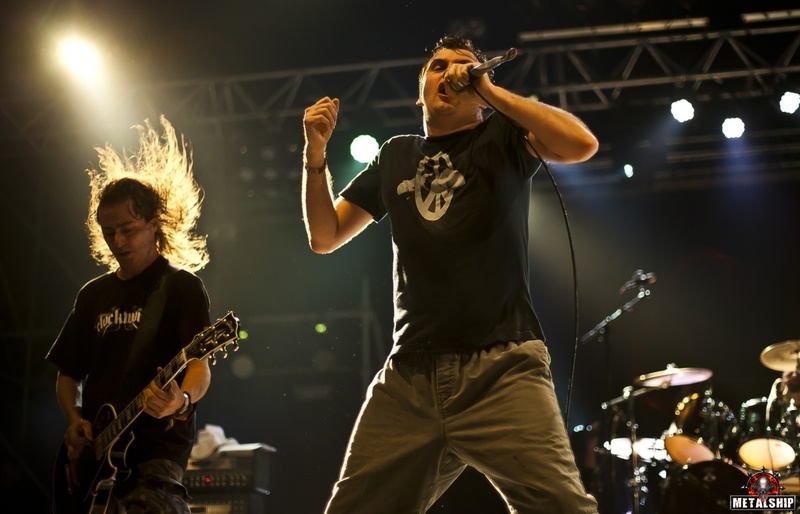 Starting in the Fall, Moll will be touring as the vocalist of legendary extreme metal outfit Napalm Death. The news comes on the heels of the announcement by singer Barney Greenway that he’d be stepping away from the band to become the Northeast Regional Communication Director for American Presidential Candidate Bernie Sanders. Greenway will rejoin the band after the election, but asked his close friend Moll to take over vocals until he’s ready to return. 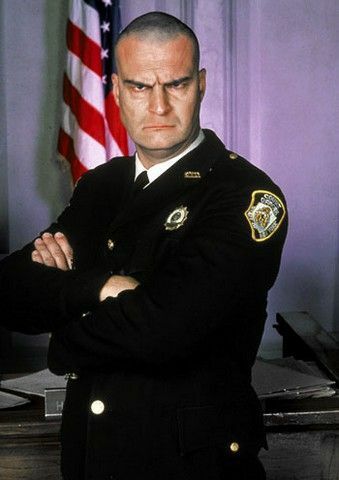 Moll, who is a diehard Napalm Death fan and even worked an occasional reference to the album ‘Utopia Banished’ into several Night Court episodes, has been doing a good deal of voice acting work and playing bit parts on television since the show ended. In his free time however, he along with former Night Court stars Markie Post, Marsha Warfield and Harry Anderson, occasionally play gigs around Los Angeles in their Anthrax cover band “We Are The Law”. The Moll fronted version of Napalm Death will be hitting North America starting in Charlotte, North Carolina in September. They plan on devoting their hour long set to playing their seminal album ‘Scum’ 17 times in a row. The band also will be going into the studio with Moll sometime in early February. They plan on going back to their grindcore roots and releasing a 14-minute, 986-song album tentatively titled “GHRRUSTLEREEDZZZZBRRR”. It will include a 6 second rendition of Jethro Tull’s entire “Thick as a Brick” album as well as a 932 nanosecond remix of Sugarhill Gang’s epic “Rapper’s Delight”. I was born in 1982, seven years shy of the end of the Vietnam War. My birthdate left me unaware of the horrors of napalm, and because I like to justify my historical ignorance with the phrase, “I don’t know because I wasn’t alive then,” I’ve remained unenlightened for the past thirty years. But the real tragedy, readers, the unspeakable terror, is that I’ve known nothing of the band Napalm Death, the darling of the grindcore genre and a pioneering influence in the celebration of noise for noise’s sake. 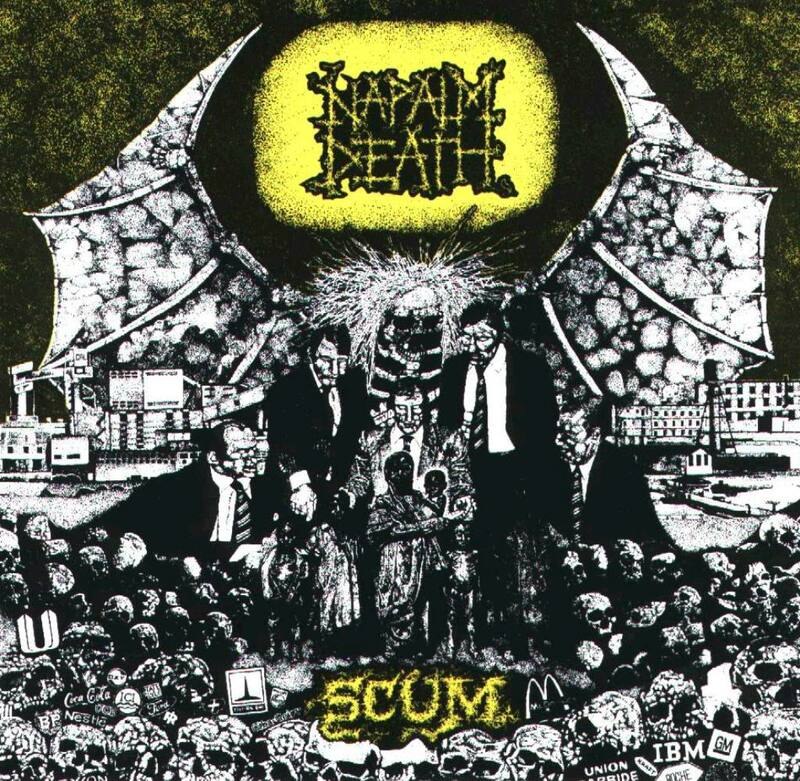 I’ve been given a gift from my friend Keith Spillett: an invitation to review Napalm Death’s debut album, “Scum.” And fittingly, my exposure to this musical vanguard was a baptism by fire, and I can say with absolute clarity that I’ve been born again. Go with me, readers, on a journey of the utmost existential significance. “Scum” opens with the introduction of our protagonist, Angry Man. We don’t learn much about Angry Man on this track, only that he likes to yell, “Genocide! Stalin!” But soon, in the track “Instinct of Survival,” we find that Angry Man does not go through life alone. He has a faithful companion, St. Bernard, prone to manic barking (“Ruff! Ruff! Ruff! Ruff!”, times 32), and St. Bernard seems to be pulling Angry Man on his leash, urging his master to keep going and demanding that the listener go the distance. Next up: “The Kill,” a track that introduces us to the album’s penchant for surprise. It opens with musical phrasing that fools us into believing that we’re to be treated to “You Really Got Me” by The Kinks. But it’s not to be: Angry Man has more to yell. And his message swells in the titular track, a song that rivetingly follows the classic A/B/A/B/C structure, A being palatable, B being obnoxious, and C being the hate child conceived between A and B premaritally. Just when we think that Angry Man could not be more eloquent, we reach track 6, “Polluted Minds.” It’s among the most lyrically complex tracks on the album, leaving us pondering our role in society’s corruption. He explodes and engages: “Do you hear my muffin?! They must die!! Yo yo yo yo yellow dress!” There’s a story here, propelling us forward. What flavor is the muffin? Does the dress have an empire waist or a fitted bodice? But then we come to track 12, “You Suffer.” The element of surprise introduced in “The Kill” finds delightful fruition here, as we meet Angry Man’s high-pitched foe: Toddler Alien. “Why?” screams Toddler Alien repeatedly, and as he belts out an aggressive duet with Angry Man, we find ourselves asking the same question. For this is the turning point of the album, the moment at which we must think critically about our need for answers, for neatly tied resolutions. We realize with sudden clarity that we’ve been waiting for Godot. As we take a breath and move on to “Point of No Return,” we begin our ascent to the album’s climax. Angry Man throws up, then eats Cookie Monster, leaving us to wonder if our hero’s tragic flaw is his weakness for tasty Muppets; the linear reversal of projectile vomiting and food consumption challenges our dependence on the concept of time. We listen helplessly in “Negative Approach” as Angry Man’s identity dissociates into SNL’s Colonel Angus coming home from war, unable to stop the mockery of Toddler Alien’s Elfin Uncle who laughs mercilessly in the background. And the cruelty of circumstance only becomes more intense. Angry Man’s destiny is not to resolve his conflict and achieve victory over his foes; we’re not to experience the catharsis of a happy ending. He loses a tooth in “Deceiver,” then finds himself bound and gagged in “Conservative Sh%^head.” His shackles remain, even after repeatedly screaming out of his rope-gagged mouth, “Just wait ’til my lawyer gets here!” His needy cries of “We want corn! We want corn!” go unacknowledged in “Pseudo Youth,” and finally his tongue is numbed in “Divine Death,” leaving us with his final intelligible phrase of the album: “Ride this thing!” Haunting. Not since Fiona Apple’s “Tidal” have I been so powerfully affected by the symbolic significance of a debut album. I recommend “Scum” unequivocally, with absolute assurance that you too will be catapulted into your own search for meaning. Readers, in our life on this earth, we won’t always be able to understand the words. Sometimes what sounds like “Die! Die! Die!” and an angry lawnmower is really a clarion call, an opportunity to question our place on earth, a chance to swing toward the absolutist tenet of nihilism or the belief that “everything happens for a reason.” Obviously, Napalm Death falls into the latter camp. 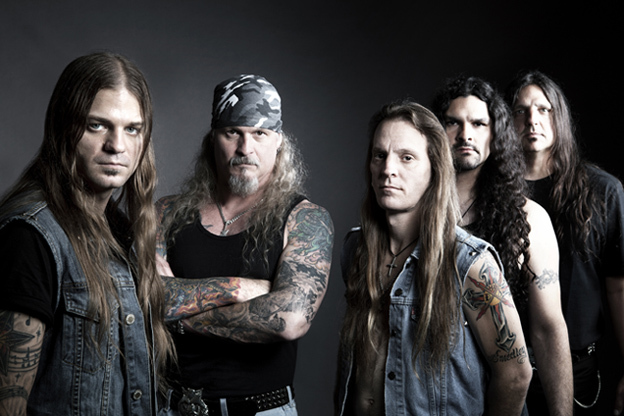 In a move designed to discourage the unauthorized distribution of their albums as well as to bleed money from their audience, German based record label Century Media have brought suit against a Little Rock, Arkansas man for illegal singing Iced Earth songs in the shower. The man, identified as David Chaste, a mechanic and father of four young children, began singing the chorus from the Iced Earth song “Wolf” while taking a shower after work on August 5th, 2012. Chaste, who did not own the album the song was on, was overheard by his wife and, therefore, was distributing property that did not belong to him. According to Cy Ganiff, the lawyer for the company, this sort of distribution of stolen property makes Chaste liable for nearly one million dollars in damages against the company. However, Century Media has offered to make the lawsuit go away if Chaste simply agrees to pay thousands of dollars in legal costs or name his next child Napalm Death. According to Century Media spokesman James Heister, the record industry loses millions of dollars a year on people using their products without permission. “Think about how many people sing songs by Century Media bands on a regular basis. That is revenue the label is entitled to. After all, it is our property and they haven’t paid to use it,” said Heister, while kicking a puppy and burning a baby with a lit cigarette. Last month, Century Media brought suit against Myrtle Washington, a 92-year-old woman who was overheard humming “The Star Spangled Banner” on line at a Kroger in New Port Richey, Florida. “The Star Spangled Banner” was, of course, first used on the Iced Earth album “The Glorious Burden”. The case was dismissed as by a local magistrate because it was considered frivolous, but that hasn’t stopped the label from looking for other creative new streams of revenue. Novel new methods of fundraising, like kidnapping and ransoming the children of those involved in illegal file sharing, are being strongly considered. In spite of the unpopularity of the suit among many fans, some have rallied in support of the label’s right to use the American legal system as a giant extortion machine. Ralph Sycophant, a lifelong metalhead, self proclaimed rebel and founder of the internet protest group called Property Over People, believes that Century Media should continue with the lawsuit. “Companies have the right to do anything they want in order to make a profit. This is America. It’s in the Constitution,” said Sycophant.